Estes in its infinite wisdom has decided to go with 1 x 9v PP3 batteries in their remodelled Astron launch controller. The story goes that they redesigned the controller so they wouldn't have to raise prices - unfortunately for the end user, these batteries are more dear than 4 x AA. Nice one, Estes! 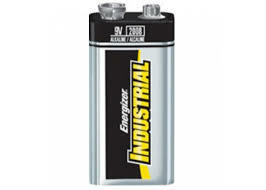 We supply Energizer or other high quality alkaline batteries for best performance. CAUTION: European Duracall PP3 9V batteries do NOT work in this controller. Save them for your smoke alarm!